Join Arutz Sheva for a look at Touro Synagogue, a symbol of freedom of worship from 1763 that was visited by George Washington. 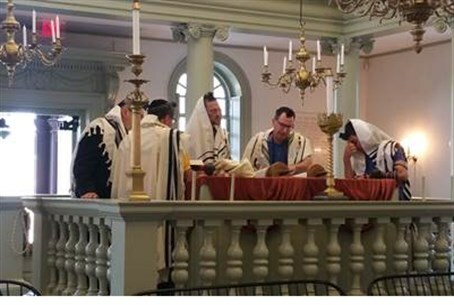 Just in time for the inauguration of El Al's new flight route from Tel Aviv to Boston, Arutz Sheva paid a visit to nearby Newport, Rhode Island to take in the impressive structure of Touro Synagogue, which is famous for being the oldest synagogue in America. The synagogue's rabbi, Rabbi Marc Mandel, noted that the construction on the historical building was completed way back in 1763; in 1946 the synagogue was designated a National Historic Site. Touro Synagogue's Jewish community, which was fleeing persecution in Europe, was famously visited in 1790 by America's first president, George Washington. Rabbi Mandel noted that during his visit the president gave his backing to the religious freedoms of the local Jewish community in a significant gesture, which he says turned the synagogue into a symbol of freedom of worship and religious tolerance. Currently there are around 140 families that are members of the synagogue according to the rabbi. He noted that aside from being an historical building, the synagogue also has an ancient Torah scroll; the 500-year-old scroll accompanied Isaac Touro from Amsterdam and was gifted by the Jewish community there before his departure. Jews first arrived in Newport in the mid 17th century CE. In 1684, not long after their arrival, the General Assembly of Rhode Island gave the community permission to conduct business, and ruled that they were entitled to the full protection of the law as "resident strangers." The unique synagogue building was constructed by Peter Harrison of Newport, who volunteered to design the house of worship. Harrison was a British American merchant and sea captain, and had taught himself architecture. At the time he began construction in 1759 he had already designed Newport's Redwood Library and King's Chapel in Boston.